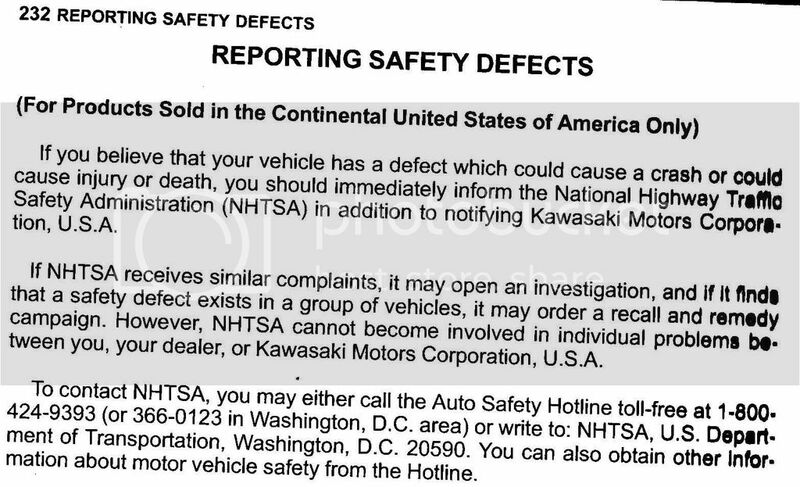 Smitty, you said a coupla pages back that you reported the brake failure to NHTSA (as per page 232 of the Owner's Manual). Please report back when you get a reply from them. My 08 been down for a while and have been watching the banter. Rear brake locked. Any new news. Learned to listen to the skilled ones for a time. Don't have 1300$ just laying around. Try opening the bleeder valve see if that will let you spin the rear wheel or I kept on stomping on the brake pedal and it finally released. Then ride using front brake only, that's how I got mine to the dealer. I had to find a new ABS unit on ebay. Found one for $150 bucks and had it installed by a local non-dealer shop (Kawasaki shop in my area wouldn't touch it, said it was outside their skillset). Cost me $150 to install. You can also delete the ABS function to the rear and make it a regular brake. I had the shop do that for me until I got the new ABS unit. No doubt you've read this thread from the start, OS. Here's some more reading for you. There are others about it in the links too. After reading for a while I opened up everything cleaned replaced all of the fluids. no luck. Even rebuilt the rear master. Cannot get any fluid past the ABS unit. Been looking for a loose ABS unit on eBay or anywhere any leads? If I am reading right a new set of stainless lines should be part of the plan? MOB how hard is it to get the ABS apart?? Thank everyone for the interesting reading. Will keep an eye on the banter. my rear brakes malfunctioned with the pedal stuck thus leaving me with no rear brakes , plugged the lines from the master cyclinder to the abs pump and ran a hose from the m/c to the calipher, brakes are better than ever , don't feel any need to replace pump. Had no problem with front brakes, other than shaking, replaced disc and solved that problem. Had the $1250.00 estimate for the pump+ labor and decided to look for alternative. Thought about the Ebay alternative with a used pump, but decided it could have the same problem. Some folks have done that on the over-active series 2 linked system to de-link the rear from the front, which removes ABS function to the rear as you have. I wonder if changing the brake fluid as per service schedule would solve the problem of sticking valves in the ABS system. ?Ideas anyone? Due to the cost of the ABS/PUMP unit I am flushing/changing brake fluid every 12 months to avoid what I suspect is a moisture caused problem in the ABS system. I would think that if you change the brake fluid every 12 months you will never have the problem some are experiencing. Brake fluid will gradually absorb moisture over time, and without you noticing -- up until the point when you first experience brake fade. Flushing your brake fluid is one of the most important preventative maintenance jobs you can do to your motor bike. Being non-silicone and 100% synthetic, Motul's DOT 5.1 is considered to be one of the highest quality brake fluids available on the market today. With a high dry boiling point of 272°c (wet boiling point 185°c), Motul DOT 5.1 is manufactured with a lower viscosity to work more effectively with modern ABS systems. Recommended for drivers who use their motor bike daily, but still need that peace-of-mind for spirited road driving and light track work. The perfect upgrade for vehicles with DOT 3 and DOT 4 brake fluid recommendations. Page created in 0.503 seconds with 26 queries.